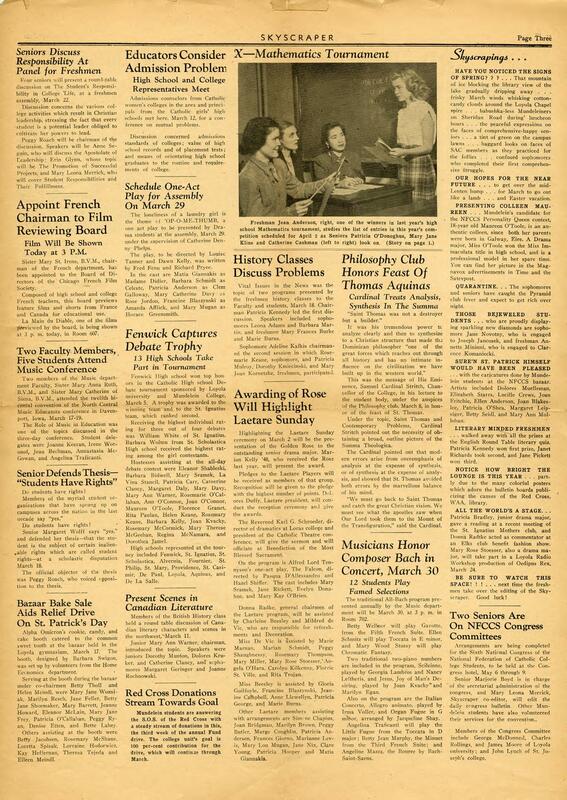 Description Student newspaper for Mundelein College which mentions Peggy Roach as a student chairman of a discussion about The Student's Responsibility in College. Physical Dimension 12" x 16"
Location Id N. 4. .1 c. 4. Rights This image is issued by the Women and Leadership Archives. Use of the image requires written permission from the Director of the Women and Leadership Archives. It may not be sold or redistributed, copied or distributed as a photograph, electronic file, or any other media. The image should not be significantly altered through conventional or electronic means. Images altered beyond standard cropping and resizing require further negotiation with the Director. The user is responsible for all issues of copyright. Please Credit: Women and Leadership Archives, Loyola University Chicago.